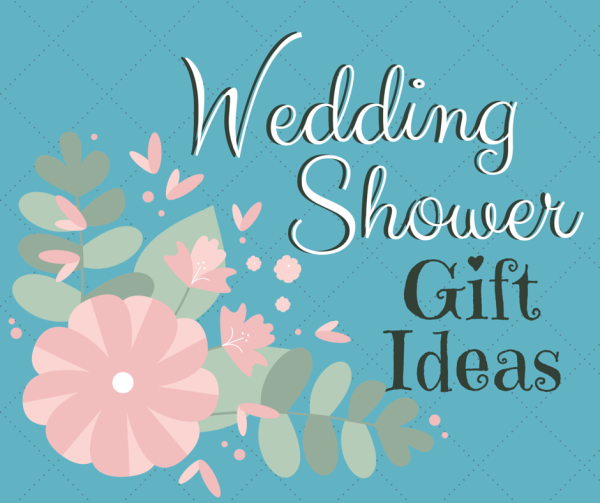 Creative wedding shower gift ideas are fun and easy to put together. 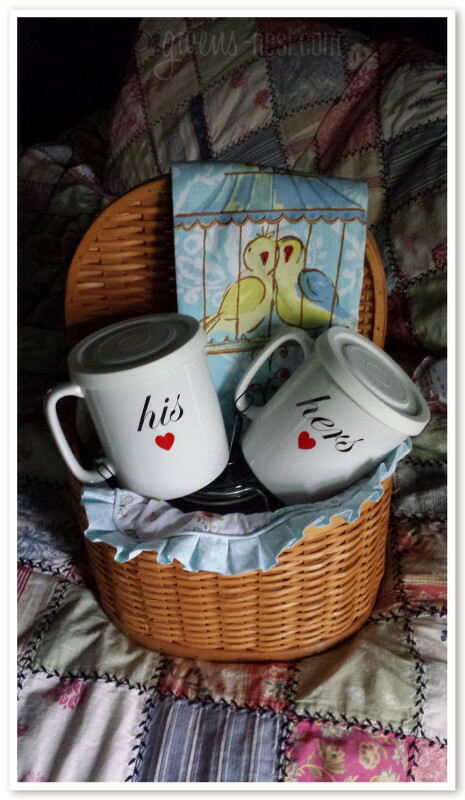 I love to take a few items from the couple’s registry (or at least their colors!) and put together a more personal gift basket. Here are a couple of ideas to get your wheels turning! After checking the couple’s registry, I found their kitchen colors, and knew that they both loved coffee. 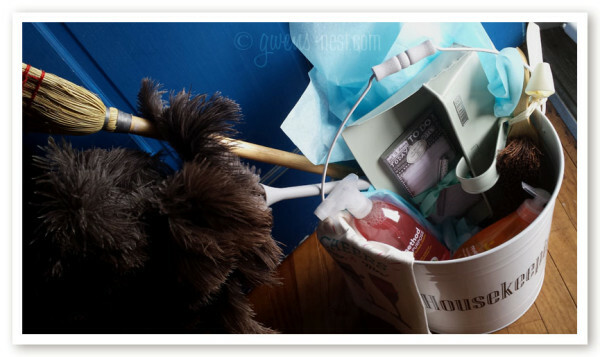 So I put together this cute gift basket for their wedding shower! 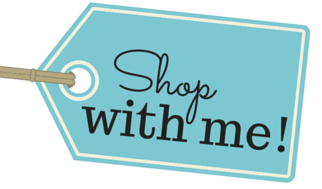 My favorite places to shop for fun pieces to the baskets are stores like Tuesday Morning, TJ Maxx, Marshalls, and Target. 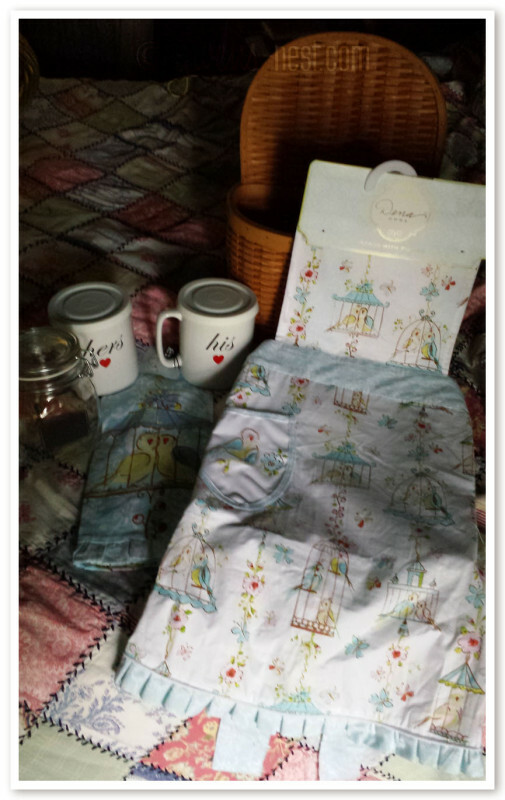 I found the His & Hers mugs with covers, an adorable apron with matching towel, and a glass jar with chalkboard label to fill with hot cocoa or their favorite coffee beans. I didn’t know the next couple as well, as it was an out of town wedding. I knew this would be their first home, and that houses need cleaning. 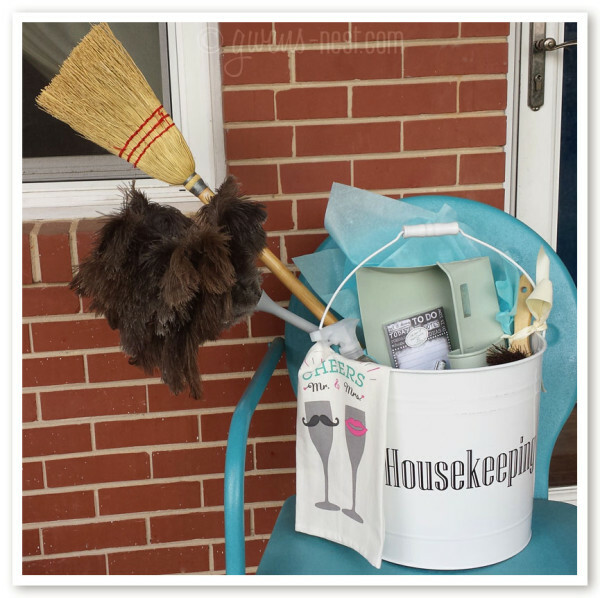 So I created this cute Housekeeping bucket with some stylish cleaning essentials. I found the bucket and the adorable dust bin and brush at TJ Maxx. The Cheers towel, to do list, and awesome ostrich duster is from Marshalls, and I grabbed some nice cleaning supplies at Target to round out the gift. 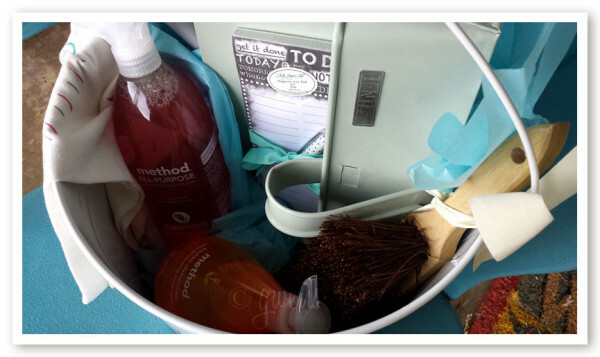 I love to give gifts that add some flair to the practical items that they’ll use all the time. One quick tip: be flexible with your gift buying plan when you head out to shop. Stores like TJ Maxx, Marshalls, and Tuesday Morning will have different merchandise nearly every time you go. That can be frustrating if you’ve got a specific idea in your head, but if you go armed just with their colors and registry info, you can almost always find something creative and fun! Someone had our wedding invitation very tastefully matted and framed to match our wedding colors. It’s hanging next to our wedding picture 20 years later. Love it! We are involved with the young adults in our very large church so we get a lot of wedding invitations. So to stay on budget, I give pretty much the same wedding gift each time. I bought cute fabric when it was on sale and cut out aprons to sew. I bought a huge cone of cotton yarn in a color that coordinates with the apron and crochet 4 – 6 dishcloths for each gift. I ordered real pretty recipe cards and copy some of my easy, family fave recipes. Then I add about 20 blank recipe cards and tie them all together with a piece of the dishcloth yarn. Throughout the year I am on the lookout for pretty casserole dishes; at Ross, TJ Maxx, or wherever I happen to be. So, the gift to the young marrieds from us is a nice, unique casserole dish, recipes, apron, and dishcloths. Ooh…what a sweet gift idea! I would have loved that as a young bride. I love how it has such a personal touch! When we were married some 31 years ago, one of my most memorable and immediately used gifts were a bread box, canister set and garbage can. Each item came with what belonged inside of each. Garbage bags, flour, sugar, coffee and tea. Since then, I try to give gifts that work together. Of course, using different ideas depending how well we know the engaged couple. I like to purchase the “Company’s Coming ” Cookie Cookbook and add to a cookie jar ( usually a clear one, so the spouse can see their hard work and yummie cookies!) cookie sheet and other baking supplies as you see fit. Could be measuring spoons and cups, oven mitts etc.